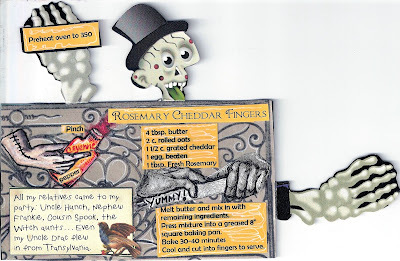 By request, I'm sharing the recipe for Rosemary Cheddar Fingers. This recipe card was made for me by WildHolly last year - in real life Holly Gagnon, a friend from atcsforall,com. She's a fabulous artist and fabulous cook! I made these for the annual Halloween party with our art group on Sunday. I used reduced fat sharp cheddar, egg substitute, and organic butter, so they are quite healthy. And really are quite good!